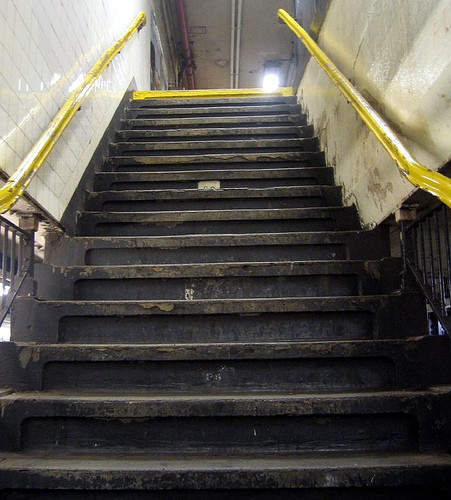 On March 4th I was climbing the stairs from the L Train platform in Union Square heading for work. As I reached the street and the cold wind blew – I felt a stabbing acidic pain in my upper stomach. As I made my way towards “The Bean” to get my cup of coffee I needed to stop and breath. When I mercifully made it into the cafe – I sat down and collected myself. Was it anxiety? The pressures and the stress I put on myself are kind of intense at times. I have always been the kind of person who truly expects more from myself and others when I know the potential is there. I know my potential should take me further that a cubicle cell – but my reality and my responsibility are the bars that restrain me yet also set me free. I collected my thoughts and my large coffee and went to work. Later on that day I went for a walk during my lunch time and found myself feeling that burning sensation once again. As I walked I thought to myself could the stress have brought on an ulcer? I ended up not eating that day and when walking towards the train station on the way home, I began to feel that feeling once again. It was then I realized it was not anxiety based. I called my brother Marcos and told him that I would be going to the hospital. I then called my wife and explained to her the situation. I walked to my car, felt the pain and began to cry knowing that something major was happening. When I picked her up I told her to drive and I explained to her the situation. I cried because I was scared – this wasn’t someone else who was in this situation – it was me. I was scared and all I could think about were my wife and children.